Events Calendar, Reviews & Comments and EPK pages. "From That Little Guy in the Corner"
looking to go deeper, whether in music or in life. Check out this series in progress on Norman's blog, FrequencyBone! NEW COMMISSION AND WORLD PREMIERE! or tune into the live stream. Look for Gabriel Langfur, faculty recital! OH MY GOSH!!! WE'RE POSTING NEWS, FOR REAL... IN 2015!! OUR SHOPPING CART ORDERING OPTION WILL BE OFFLINE UNTIL SOMETIME IN SPRING 2016 (hopefully, sooner). YouTube, Facebook... a lot! We just haven't been very good about keeping up here. and Norman's blog (FrequencyBone), please check us out in those locations! AND VERY MUCH HAPPENED IN BETWEEN HERE....!! WORLDWIDE FREQUENCY BAND OPT (Autumn Event)! Once again we are happy to open the Frequency Band Worldwide OPT to all! that is a regular Frequency Band activity. December 21st at 12:00 AM (midnight) until December 23rd at 112:00 AM (midnight) EST, Boston time. If you are on Facebook, you soon can find details for the event listed on the Frequency Band Facebook event page. ... October 2, 2012, 8:00 PM, Williams Hall, NEC, Boston! Events Calendar page for details! September 21st at 6:00 PM until September 22nd at 10:00 PM EDT, Boston time. If you are on Facebook, you soon can find details for the event listed on the Frequency Band Facebook page. VIA HIS BLOG - YEAR FOUR IS UNDERWAY! called the FrequencyBone Summer Music Connection! This summer's topic is A MUSICAL APPROACH TO THE BASICS! 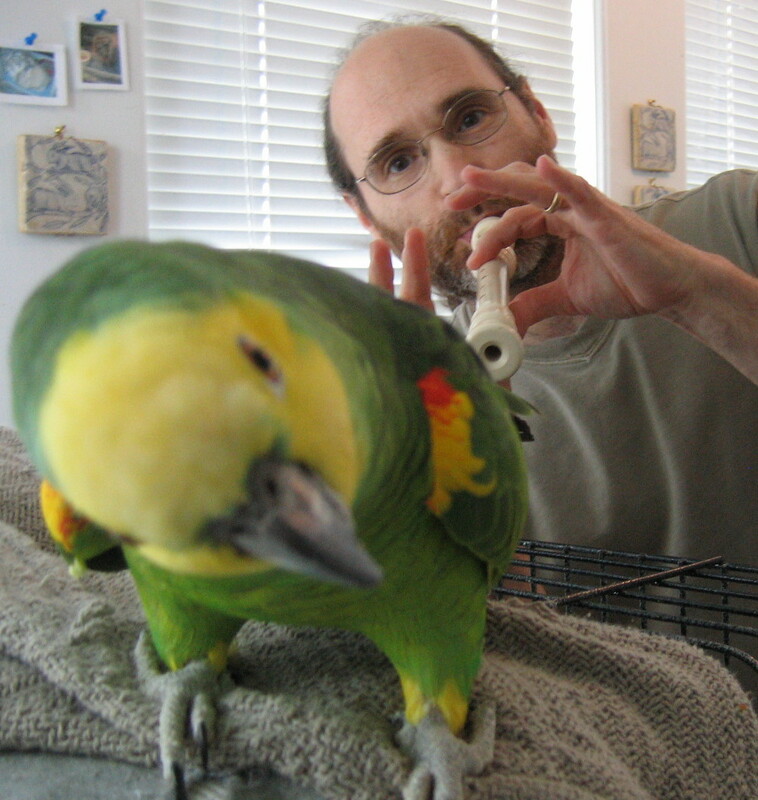 chamber music setting or in your own backyard! Videos and notes will be posted as it unfolds , so check it out and enjoy! It's free to everyone worldwide! WORLDWIDE FREQUENCY BAND OPT (Spring Event)! March 19th at 10:00 PM until March 21st at 10:00 AM EDT, Boston time. If you are on Facebook, you can find details for the event listed on the Frequency Band Facebook page. VIA HIS BLOG - YEAR THREE! WORLDWIDE FREQUENCY BAND OPT (Summer Event)! we did not have a way to include others outside the Frequency Band. Now, we have a way! Open to all (musicians and non-musicians)! until June 21st at 10:00 PM EST, Boston time. JUPITER RISE!, for trombone choir, will be premiered on February 13th, both in Jordan Hall. Please visit our Events Calendar page for details! 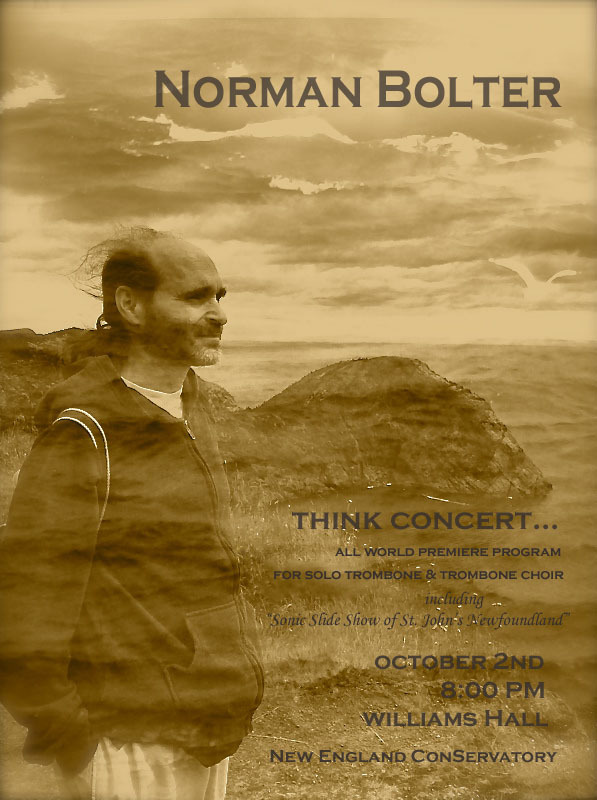 Norman Bolter will be the soloist for ONE TREK! WORLDWIDE FREQUENCY BAND OPT (Winter Event)! Now, we've found a way! Open to all (musicians and non-musicians)! until December 22nd at 10:00 PM EST, Boston time. Visit the Frequency Band on Facebook! Posted are videos, storylines, photos and events! Hope you'll stop by and say "hello"! until September 23rd at 11:00 PM, Boston time. NEWS AND PHOTOS, ON HIS BLOG! with the fantastic students and teachers of El Sistema! Check out Norman's blog to read the news and see the photos! VIA HIS BLOG - YEAR TWO! Videos and notes are being posted already , so check it out and enjoy! Now, we've found a way! Open to all! until June 21st at 10:00 PM, Boston time. ... words from another time, echoing, not dead... "to those who would valiant be." Serious inquiries only. Please send brief note of introduction and intent via or Facebook. news about the premiere and the release of this music. Coming Soon! 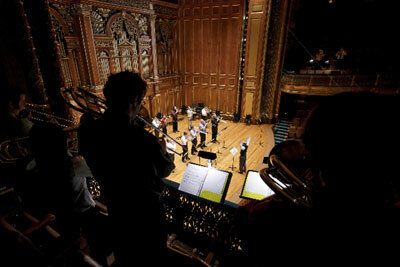 New England Conservatory's Brass Bash, in Jordan Hall, on Sunday, February 2st! For more details, visit our Events page. presenting a master class and lecture-recital! February 1st - 4th! For more details, visit our Events page. You also can follow Norman's Eastman advenure on his blog! until December 22nd at 1:00 AM, Boston time. will be able join us for this special worldwide transmission! October 29th in Bezanson Hall at the University of Massachusetts in Amherst! Norman will be playing trombone on this concert. Now, we've found a way! This is our second worldwide OPT open to all! until September 22nd at 9:00 PM, Boston time. Now, we've found a way! until June 21st at 11:00 PM, Boston time. *FIVE* NEW FREQUENCY BAND VIDEOS! You can watch "Counting Yourself In," "Connecting the 'Wires,'"
"Start with What You 'Can Do'," "Transmission: 'A Prayer for the Dying'"
are part of it. The second demonstrates a FB tuning we call "wires,"
stays alive, and the fourth and fifth introduce Frequency Band "transmission,"
each in its own way. Music in these videos, "In All Hearts," "It's Later Than You Think," "Peri-dots,"
"Listen to the Well Being," "A Prayer for the Dying" and "Unity Born of Humanity" are from our new "Phoenix" CD. We hope you enjoy and are inspired by these videos! More to come! NEW FREQUENCY BAND CD and RELATED PRINT MUSIC! In January, the Frequency Band recorded a new "Phoenix" CD! This is our first recording in seven years and our first trombone choir CD. LISTEN TO MP3 sound clips for all tracks! and more! Premiere recordings for all works! Also, most of the music on the CD is now available as print music! and watch this page and our Catalogue Recordings and Print Music Pages for ongoing updates! Videos, storyline, photos and events! We're back! And it was great!! 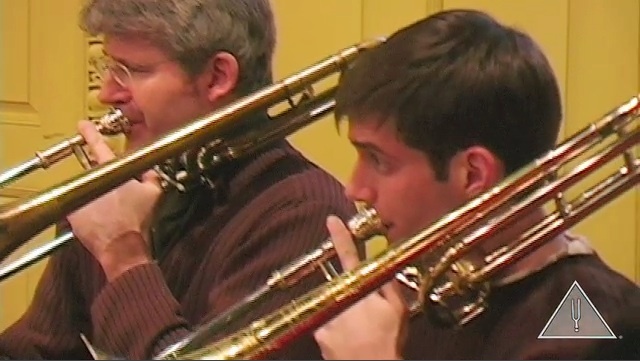 at the 2009 Eastern Trombone Workshop. 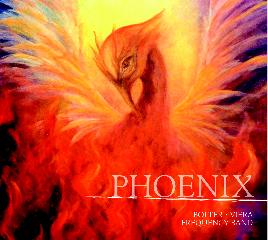 performed works from our upcoming "Phoenix" recording. Norman also gave a Master Class, "Music as a Living Thing"! For more about these events, visit our Events Calendar page! NOW AVAILABLE, FOUR NEW WORKS! ALTO FLUTE, EUPHONIUM and PIANO; and SOLO FLUTE and TROMBONE QUARTET! OPTION for three (soon four) of the works! Also available is EME, for alto flute, euphonium and piano, written with Marianne Gedigian in mind. We were fortunate to have Ms. Gedgian premiere EME, with piece with Norman Bolter on euphonium. Stay tuned for the upcoming release of the MP3 single for this premiere performance. Marianne Gedigian in mind and, indeed, she played the premiere performance! For more information and to order, please visit our Print Music Catalogue page. NORMAN BOLTER'S "MORNING WALK" AND "SAGITTARIUS2"! online catalogue, the print music for Norman Bolter's "Morning Walk"
preliminary audition repertoire for the competition. and continue to be part of it, as players and audiences. Read Norman's blog post marking this special birthday! and watch this page and our Events Calendar for upcoming FB news and events! took his final bow that day. Forgot)," for unaccompanied tenor trombone. 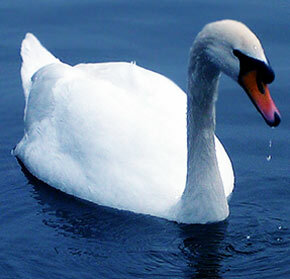 "THE FORGOTTEN ANIMAL," please visit our Print Music Catalogue page. "Mailing List Sign Up" in the drop down menu under "Contact" in the top navigation. sell, share or trade your personal information to anyone. got a warm up in at the airport, to the delight of passersby! in nature, including witnessing the Northern Lights. our Calendar page listing for this event..
Norman Bolter's "In All Hearts"
orchestra members and local students. For more information, please visit our Events Calendar and read the press release in our Electronic Press Kit. features. And now we've launched! onto your hats and enjoy the ride! (inside Jordan Hall) at the New England Conservatory. the latter two featuring soloist James Nova. please visit our Calendar page listing for this event. Norman Bolter wrote the only piece specifically composed for Symphony Hall's centennial. recorded LIVE IN CONCERT by Norman and the Frequency Band. available in MP3 format, on this website only, before its release on CD. For MORE INFORMATION and ordering, please visit our Recordings page. Enjoy! on the November 2007 WGBH interview with Norman, posted on the Audio/Video page in our Resources area, thanks to WGBH radio. Enjoy! Also, check out other new and coming developments in our Resources area. WGBH Boston radio interviewed Norman Bolter about his life with the Boston Symphony and his future plans. you can hear it by clicking their 89.7 player above. Enjoy! "retirement" from the Boston Symphony Orchestra, including his thoughts about the future.